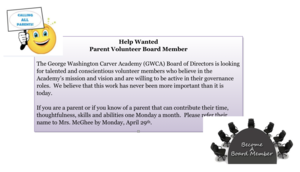 The George Washington Carver Academy (GWCA) Board of Directors is looking for talented and conscientious volunteer members who believe in the Academy’s mission and vision and are willing to be active in their governance roles. We believe that this work has never been more important than it is today. If you are a parent or if you know of a parent that can contribute their time, thoughtfulness, skills and abilities one Monday a month. Please refer their name to Mrs. McGhee by Monday, April 29th.